“How do I choose the best batting glove?” As a softball or baseball fan, this is probably a question that you ask yourself fairly regularly. That’s why we’re here to help! We’ve gathered a list of the premium batting gloves for either sport so that you can make the best decision for your game. Before we get started showing you the gloves, here are some things that you should know. Age: This refers to the age the batting glove is meant for. Getting the perfect fit is important when it comes to batting gloves, so make sure you’re getting the most appropriate glove for your age group. Color: What color is the glove? Your team might have rules for what colors you can wear for team pride, so make sure to take this into account when you’re shopping for your ideal batting gloves. 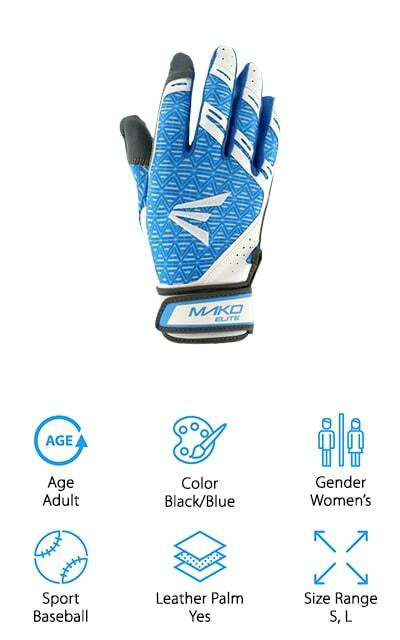 Gender: Gender is important when considering a batting glove because it can tell you how the glove will fit. Women generally have smaller hands, so their gloves are smaller, while unisex gloves can accommodate a range of hands. Sport: Softball and baseball might be very different sports, but the specifications for their batting gloves is largely the same. We’ll let you know if they are specifically meant for baseball or softball for your convenience. Leather Palm: A leather palm helps you grip your bat a little tighter. It will definitely help when it comes to keeping a hold on your bat and getting the most swing that you possibly can. It’s a great feature. Size Range: Batting gloves are not ‘one-size-fits-all’. It’s important that a glove fits well so you get the best possible grip. We’ll let you know which sizes each glove offers so you can get the best fit. Not all batting gloves are created equal, and that’s why we’ve sorted through a ton of different options to bring you the best. The best baseball batting gloves are on our list, paired with the best softball batting gloves and gloves that work for both sports. Our top pick and budget pick are highlights, so check them out before moving through the rest of the list. Batter up! Let’s get started. 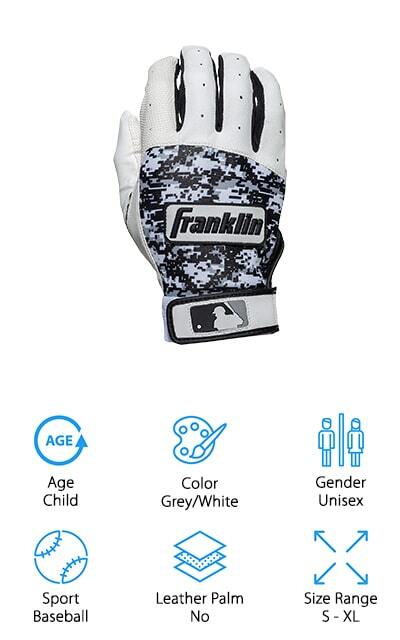 Check out these cheap batting gloves by Franklin Sports if you’re looking to play ball on a budget! These gloves do not include a leather palm, but they do have a top-grade leather heel patch that will help you keep a comfortable grip on your bat. It includes Tri-Curve technology for a perfect 3-way fit. The outside of the glove gives you a little bit of a digital camouflage styling, while the palm is made of microfiber that has been digitally etched so you get the best grip while still remaining flexible and comfortable. These are some of the best youth baseball batting gloves that we could find, with sizes ranging from small to extra-large so you get the perfect fit each and every time! These gloves are multi-functional and great for your young athletes. We love the camo print and the etched microfiber palm to help you keep a great grip. You will too! 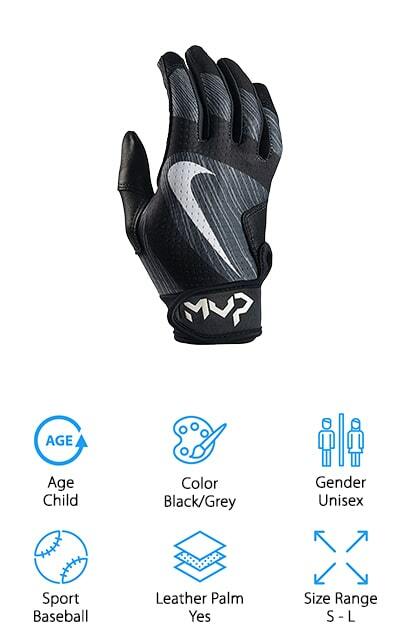 When you need a pair of the best youth batting gloves, go with these Nike MVP gloves! They are available in sizes small to large, and they are further adjustable via the hook-and-loop strap at the closure. The perfect fit is important for exceptional batting, so make sure that your gloves fit just right. The perforated mesh on the back of the glove improves airflow and ventilation, so your hands won’t get too sweaty while you’re playing ball. The palm is made of smooth goat leather to help you get a superior hold on the bat and remain in control. The seams are rolled so the gloves feel smooth and look great. Your entire team is going to be jealous of your gloves! The logo for Nike Baseball is on the back of the hand, cleverly hidden in the mesh. For great-looking, great-fitting gloves for your little MVP, go with these great, high-quality gloves from Nike. Clutch makes these great signature batting gloves with their interlocking design. The back of the glove is sublimated to improve the comfort and mobility you get from the gloves. They are free of any restriction so you can move exactly how you need to increase your batting average. The finger patterns are pre-curved so that they fit a little more naturally on your fingers, and the entire glove is covered with an exterior mesh that allows your hands to breathe so they don’t get too sweaty. This will mean that you can keep your grip even after you’ve been up to bat a few times. Keep your hands dry all game long! They come in a range of sizes from medium to 2XL, and it will fit youths and adults so everyone can get the enhanced grip for batting! We love these gloves and we know that your entire baseball and softball family will too. 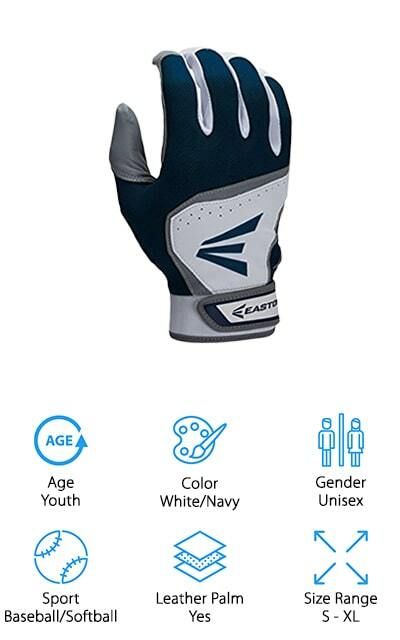 Easton makes these youth batting gloves that come in a few colors, from the white and navy that you see here to royal blue and white or red and white. The palm is made of a soft sheepskin leather that provides you with a great grip and superior comfort no matter how long your game lasts. Every knuckle and joint on the gloves have four-way stretching mesh to keep you moving while you’re going after the ball. The wrist is made of neoprene, so it’s comfortable and padded, with durable and breathable support to keep the sweat on your hands down and to keep you comfortable throughout the whole game. These gloves are amazingly soft and your little baseball or softball players are definitely going to love them. 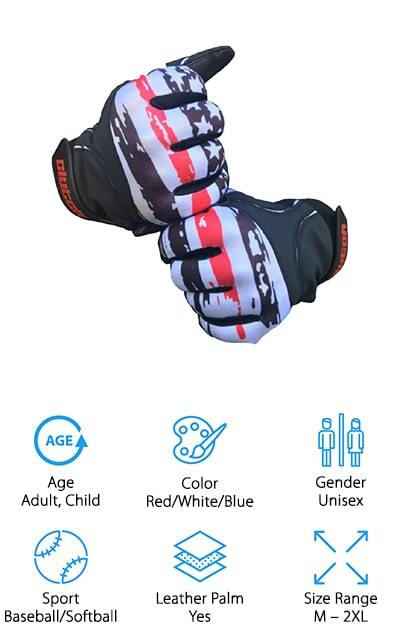 We’re sure that they’re going to love how much these gloves look like adult batting gloves, and they’re the best batting gloves for slow pitch softball, too! 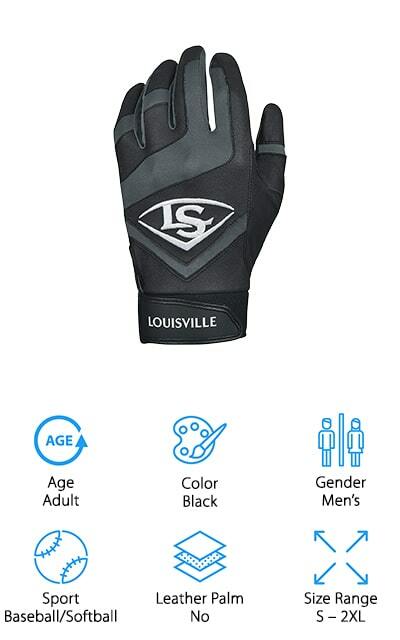 Louisville Slugger, the iconic baseball bat company, makes these adult batting gloves. They come in sizes ranging from small to 2XL so you can choose the perfect fit for your hands. The back of the hand is made of a stretch lycra that’s flexible and breathable so you can move your hands exactly how you need to. The palm is one piece of embossed synthetic material that offers a no-slip grip on your favorite baseball or softball bat. The wrist strap is made of comfortable Neoprene so it fits comfortably and supports your wrists. This is great for long batting sessions. Everything about these gloves is intuitive, as you can imagine from the popular bat brand. They are some of the best men’s batting gloves on the market, with so many features that can improve your batting performance and up your game. These are also some of the best batting gloves for grip that we could find! 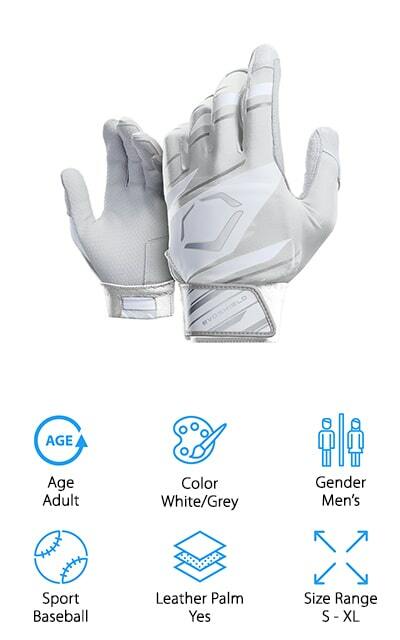 These batting gloves by LÜNA have a ton of features that will make you love them for your baseball and softball games. This includes a thumb mesh and finger vents, as well as micro fabric finger linings, help to keep your hands dry and wick away sweat and moisture. Your hands will stay cool, too! The palm is digitally embossed leather so that you can get a good grip and feel of the bat while you’re waiting to hit the ball out of the park. The cuff is adjustable and made of comfortable neoprene, but remains flexible enough that your wrist still has all of its mobility. It fastens with a secure Velcro hook and loop so it won’t slip in the middle of your game. 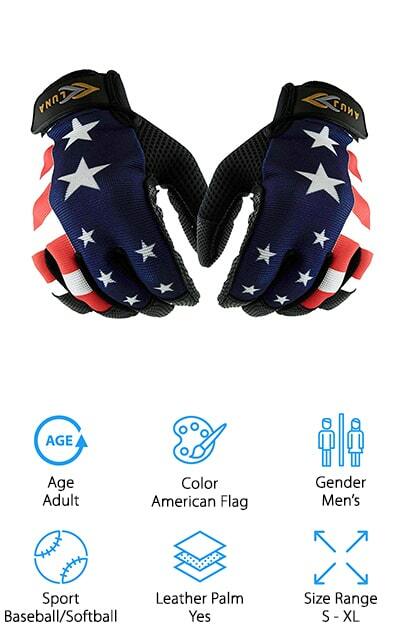 The design on the outside of the hand is a patriotic American Flag, so you can show your love for the country while playing America’s favorite pastime. These are great gloves! These Fastpitch gloves are made of superior, premium leather that is comfortable and provides you with a great grip. All of the flex points (every knuckle and joint) have special four-way flexibility, making sure that you can use your fingers to their full capabilities while you’re up to bat. There are four-way stretch mesh panels all over the gloves to add breathability, and to make sure that your hands don’t get too sweaty during the game. The pattern on the back of the hand is a neat digital camouflage with orange detailing, which makes for a great, stylish touch on your gloves. The wrist closure is adjustable, offering a secure fit for all of your batting needs. 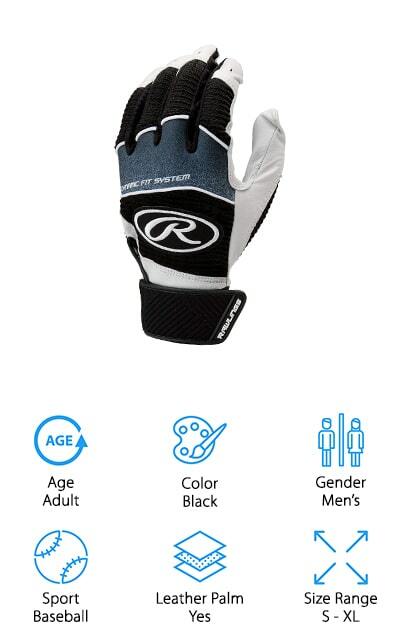 These gloves are made for adult women, and they are one of the only high-quality women’s batting gloves we could find. If you don’t want to deal with unisex gloves, get the ones that will fit your hands the best! Rawlings makes these Workhorse Batting Gloves which are some of the best batting gloves with padding on our list. They have these extra durable pads in the palm area, behind the leather. This way you get the most out of your gloves without an ache in your hands. They have double-knit spandex gussets to keep your fingers and joints working well, as well as a reinforced elastic closure to help make sure that the gloves fit you the best that they possibly can. The palm is made of leather from their Dynamic Fit System, so you get the best-quality grip that you can. Rawlings aims to make your baseball game that much better with quality gear made of the best materials. Go with a name you can trust, like Rawlings: they’ve been making quality sports equipment for a long time. These gloves are one of their most popular designs for amazing baseball batting gloves. You’ll love them! EvoShield makes these high-quality adult batting gloves. The premium, tactile leather on the palm make them some of the best grip batting gloves on our list. They feature the ultimate grip due to the flexible leather, giving you a great feel of the bat and superior grip that won’t slip around. The hand shield molds to the unique shape of your hand in order to be more supportive and helpful while you’re batting, due to a unique gel system that you activate the first time you wear the gloves. They’ll be your constant companion for many games and practices. They come with green accents, red accents, and blue as well as a striking black and yellow version if that’s more your style. 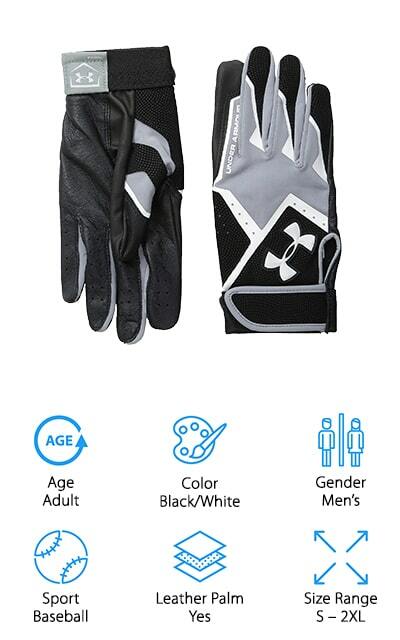 Technology and function meet in these amazing batting gloves for men! You’re going to love how supportive they are, and you’ll wonder how you survived with other gloves. We’re sure you’ve found your new favorite gloves!